Why Use Abrasive Flow Machining? Abrasive Flow Machining was developed in the 1960’s, as a method of smoothing and polishing internal surfaces, and producing controlled radii. Hand polishing or deburring can result in inconsistent or inefficient results, and can be impossible to perform on complicated or internal surfaces. The process can also optimize the flow coefficient or improve the high and low cycle fatigue strength of certain pieces. Abrasive Flow Machining works by the back and forth flow under pressure of an abrasive laden, viscoelastic compound or abrasive media, through a holding fixture and over the area to be polished, deburred and radiused. In a typical, two-way flow process, two vertically opposed cylinders extrude the abrasive media back and forth through passages formed by the workpiece and tooling. 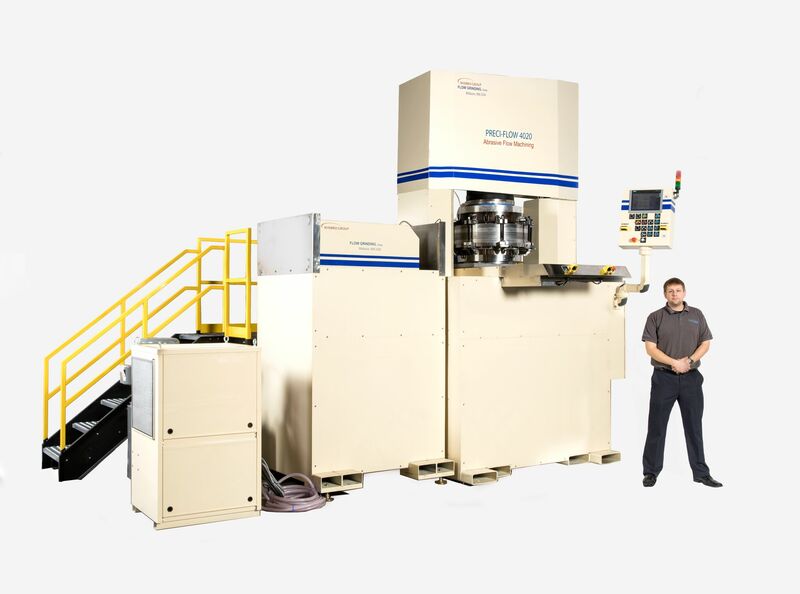 In a one-way system, the abrasive media flows in only one direction, allowing the media to exit the part for fast processing, easy cleaning, or simple, quick-exchange tooling. 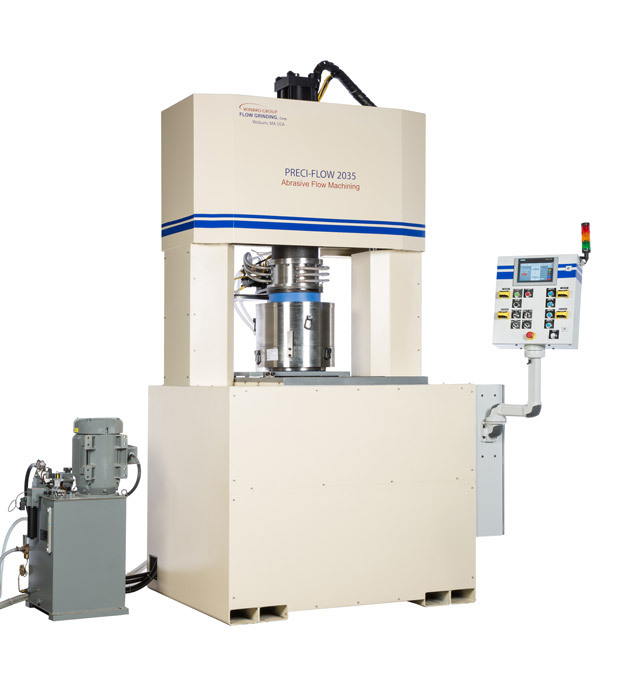 The process involves three principle elements: a fixture, the machine, and the abrasive. 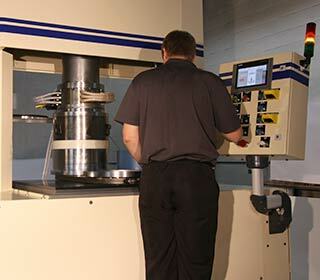 The holding fixture is designed to increase the velocity of the abrasive compound in the area to be processed. The increase in velocity concentrates the material removal to specific areas of the work piece. Fixtures can be made from inexpensive, structural-grade nylon that provides a more adequate strength-to-weight ratio, and can be easily machined to custom configurations. High production fixtures are made from steel or aluminum and use polyurethane coated inserts to protect the workpiece from abrasive scratching or grooving. 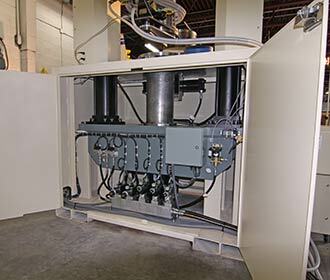 Depending on part size and machine size fixtures can hold from 1 to 50 or more. A flow grinding machine serves several functions. First, it must be able to pump the abrasive media at either a specified pressure (PSI/MPa) or flow rate (cubic inches per second/liters per minute). Second, it must be able to clamp and seal the fixture between the upper and lower media cylinders, in a two-way flow system. Both of these functions are usually accomplished by hydraulic cylinders. The abrasive media is pumped from the pre-loaded lower media cylinder, by advancing the lower media piston, and then flows through the clamped fixture and finally up into the upper media cylinder. When the lower media piston is fully advanced, the flow is reversed; the upper media piston advances, returning the media through the fixture and back into the lower cylinder. This flow cycle represents one sequence, and is repeated until the preset total media displacement value (cubic inches/liters) has been achieved. 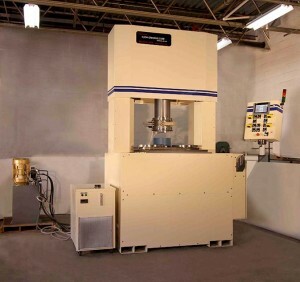 Most production AFM machines also include a media chiller to remove heat generated by the grinding action, and a fixture transport device, such as a shuttle or rotary table, to index fixtures from a load/unload station, to the processing position between the media cylinders. An automatic media reservoir can be used to pre-fill fixtures having large internal volumes with abrasive media, and ensure that there is enough media for the machine to always run at it’s full displacement piston stroke (to avoid “short cycling”). View our specification/description sheets for our compact line and high capacity line. The abrasive media used in Abrasive Flow Grinding provides the actual material removal: polishing, deburring and edge radiusing. The media base, is a viscoelastic semi-solid, which can range in viscosity from a firm putty-like material to a soft, almost grease like consistency. At Winbro Flow Grinding we custom make this material for our customers particular grinding needs. Read more about this custom tailored solution in our Abrasive Media System page. We can work with you to produce a controlled manufacturing solution that fits your needs, whether it is for Abrasive Flow Machining or Electrochemical Deburring. For more information about these solutions, please visit our Part Processing / Contract Finishing Services page.